In addition to the system defined fields Document ID, Title and Description, a new configurable single select field, Status, has been added in TeamForge 17.1. In addition to the default values, DRAFT and FINAL, you can now add custom statuses for documents. 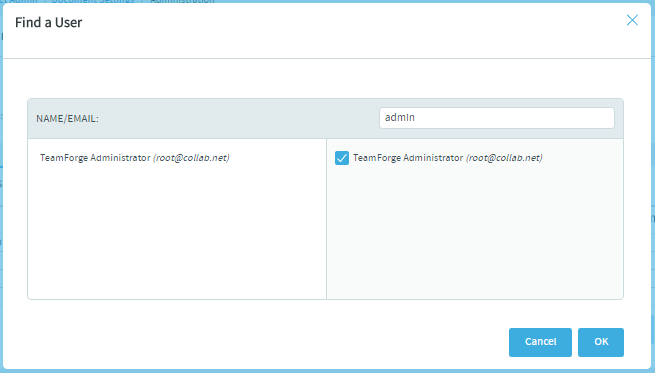 You can also select one or more TeamForge users, for example project administrators and scrum masters, as mandatory document reviewers. This ensures that all project documents go through them when document reviews are initiated. To configure document settings for a project, select the project from My Workspace menu and select Project Home > Project Admin > Document Settings. Add one or more default document reviewers. Click the Default Document Reviewers field's search icon. Search and select users from the Find a User dialog box and click OK.
Set up custom document statuses. In addition to the default document statuses, DRAFT and FINAL, you can add one or more custom document statuses. Select the DOCUMENT FIELDS tab and click the Status field. The Edit Field page appears. Click Add. A new row is added in the Values section. 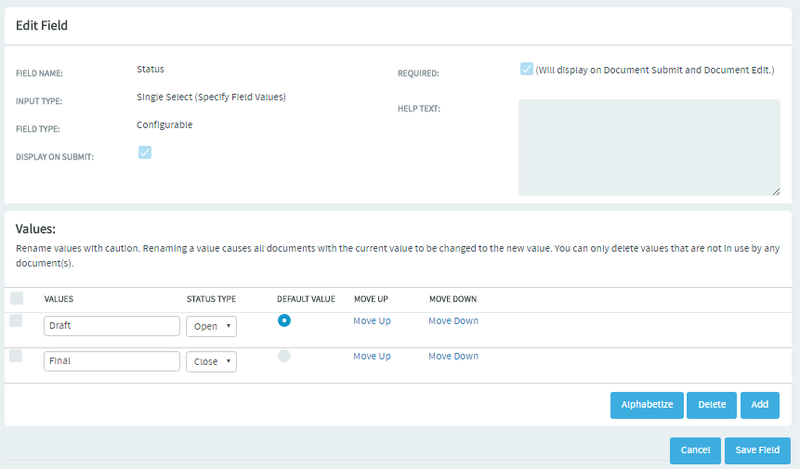 Type the name of the new document status, select a status type (open or close) from the drop-down list and select the Default Value option if you want to make this the default status when a document is created. You can move the row up or down by clicking the Move Up and Move Down links, if required. When done, click Save Field. A confirmation message appears. Click OK to save the new status. Repeat the above steps to add more custom document statuses.